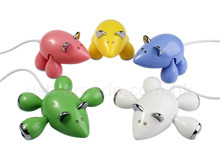 This mouse USB hub has four ports, one of each of its legs. They’re all USB 2.0 and it comes in a variety of colors. 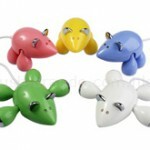 Check out the Mouse USB Hub at Brando.com. 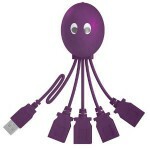 This Octopus USB Hub also has four ports and also comes in a variety of colors. I personally like the purple. 🙂 You can get it at Amazon.com. 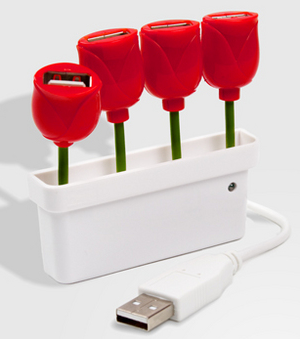 This Tulip USB Hub is so adorable! 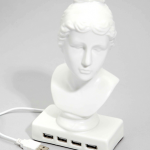 Your desk will be spring-like all year with this hub. 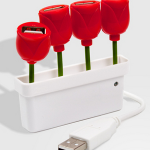 Get the Tulip USB Hub at FredFlare.com. 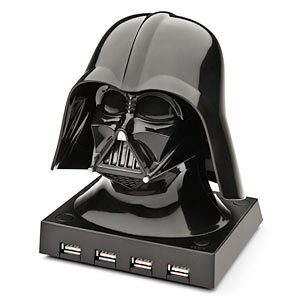 I love the elegance of this USB Hub. It is also four port in the image of the Goddess of Love herself, Aphrodite. 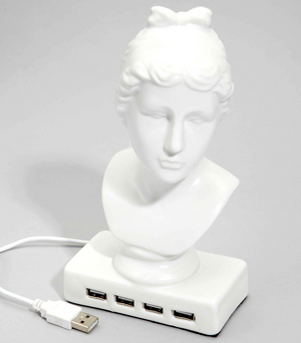 This awesome Aphrodite USB Hub also available at FredFlare.com. Pink, Retro and totally cute! I love this USB hub styled to look like an old school cassette tape. It has four ports and comes in pink, black and gray. 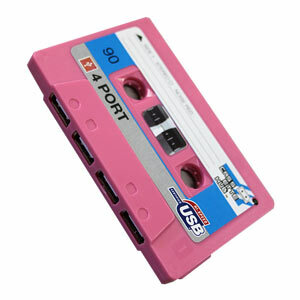 Order the cassette tape USB hub from J-List.com. These next few aren’t too cute, but I couldn’t leave them off because I always appreciate geeky products! How cool is this Darth Vader USB Hub? Use it to instantly increase your nerd cred (or to kill any chances of getting laid?) while giving you more connectivity options. Buy one for yourself at (where else?) ThinkGeek.com. 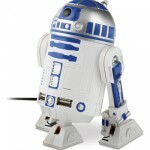 Of course, you can’t put out a Vader USB Hub and NOT put out an R2-D2 version! Here is above, boasting the same features as the Vader version, except for maybe the fear factor. Also available from ThinkGeek.com. 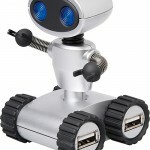 Okay, maybe this robot doesn’t belong to a famous movie franchise, but he’s still cute! 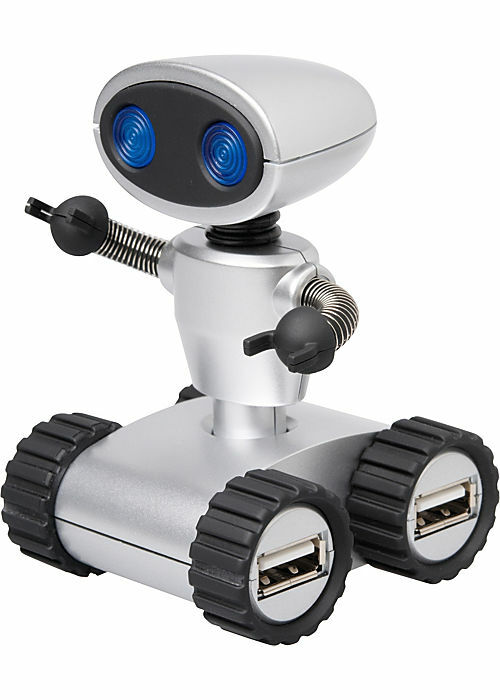 His eyes light up when you connect him, and his arms and wheels actually work! How cute is that? Get yours at Paper-Source.com. 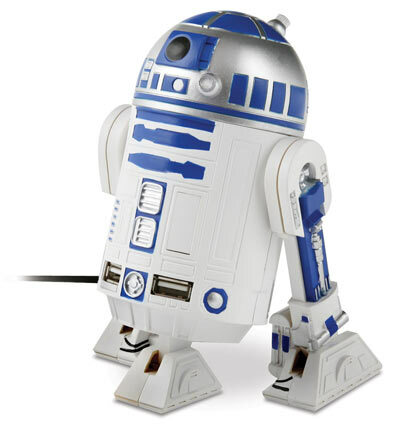 I think I’m going to buy that R2-D2!